Relaxation and beauty await you at Hartstene Pointe, a gated community on Hartstene Island. Our spacious custom built home completed May 2008 offers 2400 sq feet of comfort. Whether you want a large family vacation or a quick getaway for 2, our cabin at the Pointe will become a destination you want to return to every year. Situated in a beachfront vacation community with club house, pool, hot tub, tennis courts, gazebo's on the beach and more.There is something for every one to do. The cabin is equipped with 8 mountain bicycles, games , movies and lots of room to relax. The entertainment room is 22 feet by 27 feet and is isolated from the living room to offer peace and quiet while the kids enjoy themselves. Peace and Quiet at the tip of the Island: Hartstene Pointe is close to Metropolitan areas yet as far away from it all as you can go. The road stops here and so does the noise and hussel bussel of city living. Among the trees deer and other wildlife wonder about without concern for their safety, The posted 15 mph speed limit is patrolled to keep the area safe for hikers and bicyclists young and old. Rhodendrons and more. Get in touch with nature while sitting on the front porch (10x12 feet ) or the rear deck (12x20 )feet or look out any window. Regardless of the season this is all about relaxing be it outdoors or snuggled in front of the gas fireplace. Hartstene Pointe has a lot to offer. : The Pointe has 3.5 miles of private beach, sheltered picnic areas, tennis courts, basketball, club house, pool and jacuzzi. There are numerous trails to hike or just stroll along the beach. The Barmons enjoyed the serenity of the Harstine Pointe environment for years and hope you will too. In fact, Harry loves Harstine Island so much that he was on the Board of Directors and head of the Architectural Control Committee of the Hartstene Pointe community at its beginning. He also personally poured the concrete on the original fire station, supervised volunteers and framed the structure which was later converted into the fitness gym. Harry designed and built Barmon's Vacation Home what it is today. Harry and a small crew had worked tirelessly weekend after weekend to construct the foundation, framing, siding, stone work and finish on the house. The hardwood moldings were made and finished on site. Harry paid close attention to detail when designing this house for form and function. You are safe from snow or tree falling while in Barmon's vacation home as the engineered structure was designed for shear and wind resistance to withstand such a blow. Much of what you see inside the house is attributed to Sue's gifted talent of interior decorating. The interior design is an expression of Sue's endeavor to create a relaxing and inviting setting to blend the interior with the forest surroundings. Sue's careful eye and design skills can be seen through out the house right down to the door bell bear paw. Whether they were on vacation or out shopping, Sue's amazing ability to think of everything tied all of the decorating elements together before the house was finish being built. Her incredible attention to detail makes this home show room ready and worthy of a magazine spread. As you walk around the house, you'll notice the stylish, professionally framed art, black and white photography. Talent runs in the Barmon's family, as these photos were taken by their 14 year old daughter, Lauren. Also, in the bathrooms, the high end custom tile work was done by the Barmon's talented nephew, Travis. Landscaping of native plants was also professionally done by David Barmon's landscape and design company which specializes in native plants. As you can see, the Barmons are dedicated in making this wonderful vacation home as though you would want your home to be. The Barmons have enjoyed this home for years and want to share it with you. Our home is equipped to provide all of the comforts that you might expect from the finest of vacation rentals. Set in tall native Douglas Fir, Cedar and Hemlock the home was designed to keep touch with its surroundings. Whether sitting in front of the fireplace looking out through the expansive wall of windows enjoying a passing storm or kicked back at the community pool or at the beach on a sunny day this is the place to relax regardless of the weather. We strive to make your vacation a memorable experience where you can relax with friends and family or share a private getaway for two. Bathrooms have heated tile floors and top of line fixtures with custom made bamboo cabinets and super quiet fans. Towels and hair dryers are provided in each bath room. Hartstene Pointe is located on the Northern most tip of Harstene Island and has 3,5 miles of private beach that surrounds the development.. There is beach in almost every direction.you walk. Hartstene Pointe is located in a rural setting distant from but not too far from the city of Shelton, WA. Heat pump that provides both heating and air conditioning. Heat pump with gas 90 plus back up. Bath, Hand and Beach towels provided. Some in the garage and at the Community exercise room. Complete setting for 8 plus. There are 3 stereo systems located in the Living Room, Master Bedroom and in the Bonus room. There is and extensive selection of books in the house plus a library at the club house. Provided are several games for all ages. The pool table is located in the clubhouse. Over 200 movies for all ages. Professionally landscaped in native plants with Apple and plum trees and blueberry bushes. Native huckleberries are everywhere. Provided is an inflatable boat with life jackets for all ages. The rear deck has 2 patio tables and 12 chairs and lots of room. Is near by off island at Bayshore Golf. Olympic size pool is located two blocks away at the club house. The hot tub is located next to the Olympic size swimming pool. Between the cabin and the Pointe amenities, there are activities for everyone of all ages. Just bring your clothes and food and kick back and relax. About Harstine Island There’s a little place called paradise that we all like to go when we want to get away from it all. Many people have different ideas and names for it. We call it Harstine Island. Harstine Island offers peace, quiet and tranquility with breathtaking views, abundant wildlife and great fun for the whole family. This island is heavily forested with Douglas Fir, Hemlock and Cedar trees. There are much wild life from deer and wild birds to ocean beach sea life such as sea lions, seals, and otters. Yet civilization is but a short 20 minutes drive to the small town of Shelton, Washington. The big cities are only minutes away yet this (18.651 sq mi) island is tucked away in the Pudget Sound as a secret hide away. On this island is a private gated community known as Hartstene Pointe minutes drive from Shelton, WA. The house is as advertised...and probably better. Loved all of the games, toys and movies tucked in there as we had one rainy day and two 7-year-olds to keep entertained. Also, we made use of the clubhouse, play structure, beaches, bikes and hiking trails on better weather days. On our rainy evening, we made a fire and s’mores at a covered picnic structure by the beach. We really enjoyed our time at this house and at Hatstene Pointe. We will return. We needed a place to stay on short notice and the owners were so helpful in accommodating our visit. We enjoyed so much wanted to extend our stay and again owners were responsive right away. 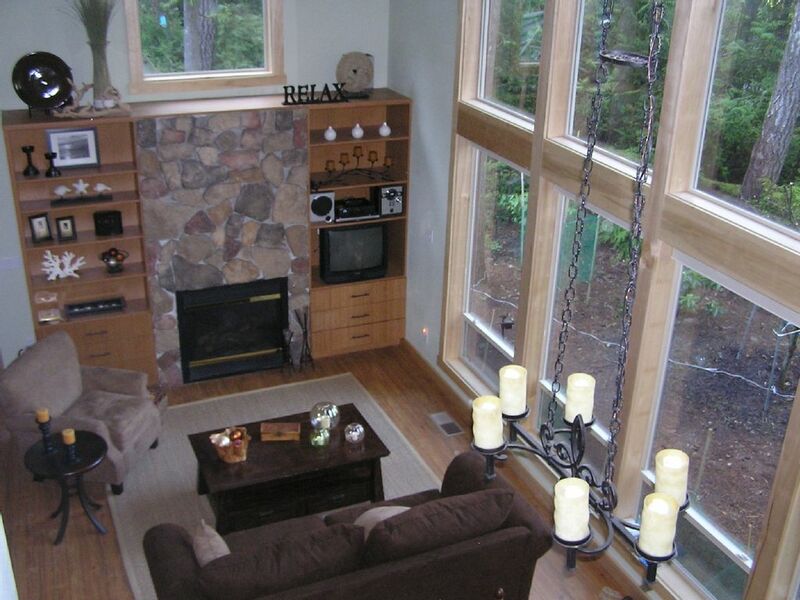 We can highly recommend the beautiful and spacious home located in a gorgeous wooded area like a park. Our experience is 100% positive and we plan to book again. The house is absolutely gorgeous. Perfect for two couples and a child. Only one set of keys and one keycard made it logistically difficult for us to do different things but we managed. No instructions in the house caused a little bit of tension with the office staff. Microwave did not work and no instructions on how to operate the fireplace. Lots of trying to figure things out. I would definitely stay here again but would make sure that I got clearer instructions on coming and going. A map of Harstene Pointe would definitely help as would brochures of things to do in the area. There should have been an welcome letter sent automatically from Homeaway that details all of the above plus much more. Good to know that there is a failure in the system. There is always the option of a phone call to me and I will respond within 12 hours maximum. We felt very safe and comfortable in the community . It was fun exploring the island, with a map it would be faster . Our stay was in the end of July and temperatures were very high, so cool house felt so nice after a long hike . We enjoyed all that space , everyone had own corner. Lots of books, too bad that we did not have time for them. Lots of toys for kids. Kitchen was very accommodating for all our needs. We had enjoyed our short but sweet vacation at Barnon”s house. Beautiful Home, well maintained. Great for a quiet retreat. In a nice community with lovely views of nature. We saw deer every day. The home fit our family of 6 very nicely. We had no problems during our stay. The house is stocked with everything you could need. Plenty of dishes and utilities in the kitchen, plenty of bedding and towels. We had a lovely time and enjoyed our stay. This home was lovely, spacious, and stocked with everything a family needs for a wonderful and relaxing vacation. The area is also beautiful, and the neighbors are very friendly and helpful. Maximum Occupancy is Eight. 4 pm check in to 11am checkout. This is a non smoking pet free environment. Violation of this rule will result in a minimum penalty of $ 500.00.charged to your credit card. All furniture shall be returned to its original location before leaving. If done by housekeeping additional fees will be assessed. Laundry- Renter shall place one load in washing machine and run it upon leaving. Dishes - Renter shall load dishwasher and run it upon leaving. Excessive cleaning shall be assessed additional cleaning fee from security deposit.